RESTRICTED TO EDITORIAL USE. No use with unauthorized audio, video, data, fixture lists, club/league logos or ‘live’ services. Online in-match use limited to 75 images, no video emulation. No use in betting, games or single club/league/player publications. MANCHESTER: Jesse Lingard repaid Manchester United manager Louis van Gaal’s faith as his first goal for the club set them up for a 2-0 win over West Bromwich Albion yesterday. Van Gaal gave Lingard his first league start since the Dutchman’s inaugural game in charge at the start of last season, having used his column in the match-day programme to praise the progress being made by the 22-year-old. The United manager also claimed that Lingard’s first goal would not be far away and he was proved right as the attacking midfielder, a product of United’s youth system, struck in the 52nd minute. Lingard’s strike eased the growing frustration around Old Trafford and Juan Mata added a late penalty to seal a win that took United to within a point of Premier League co-leaders Manchester City, Arsenal and Leicester City. United’s impressive defensive record-which has now seen them keep five successive clean sheets-was further enhanced, but again they struggled to create chances. Lingard’s goal, an assured right-foot finish from outside the box, remains the only one they have scored from open play in their last four domestic fixtures. It had taken a late goal from Wayne Rooney in mid-week to end CSKA Moscow’s resistance in the Champions League and United were faced with a similar test as West Brom came to defend in numbers. Albion had won on their previous two visits to Old Trafford, with their 1-0 success in May the last time United had lost at home. That day the visitors had conceded 80 percent of possession and they again stuck to that blueprint as United were allowed to have the ball almost at will. It was rarely in a dangerous area, however, as West Brom, who had conceded in only one of their previous five away games in the league this season, were content to sit deep and try to keep the home side at arm’s length. Only three times in the first half did United manage to gain a clear sight of the visitors’ goal, but from the first Mata was unable to curl the ball inside the far post after being played in by Rooney. 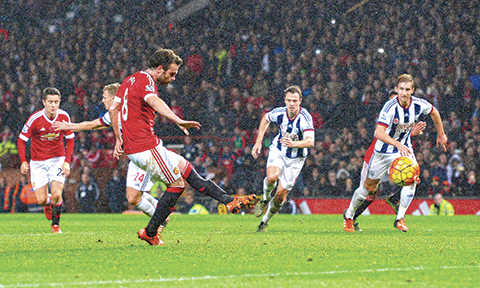 The second was self-inflicted as West Brom defender Craig Dawson gave the ball away to Anthony Martial, who released Lingard, only for ex-United defender Jonny Evans to slide in with an excellent block. Albion goalkeeper Boaz Myhill was finally forced to make his first meaningful save a minute before the break, but it was no more than a routine parry to keep out Martial’s rasping shot from the edge of the penalty area. The start of the second half threatened more of the same and the impatience of the United supporters was just starting to show when Lingard got off the mark in impressive style. Martial’s cross was headed clear by Chris Brunt to the England Under-21 international, who showed great composure to take a touch and curl a low shot past Myhill from 22 yards. West Brom’s response was not immediate, but after manager Tony Pulis made two substitutions in the 72nd minute and committed more men forward, his side should have equalised. Dawson delivered a cross from the right that arrived perfectly for Saido Berahino, who scored the winner here two seasons ago, to meet six yards from goal with virtually his first touch after coming off the bench.